Go to original pattern for design DROPS 187-24. 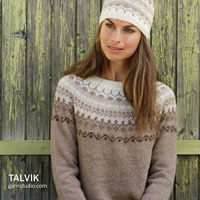 Sweater with stripes, lace pattern, long vent and ¾ sleeves, crocheted top down. Size: S - XXXL Piece is crocheted in DROPS Paris. DROPS CROCHET HOOK SIZE 5.5 mm/US 9 - or size needed to get 13 double crochets x 8 rows = 10 cm / 4'' in width and 10 cm / 4'' vertically. 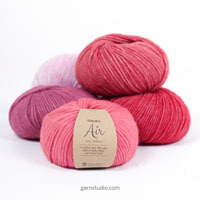 You can get the yarn to make this pattern from	30.60$. Read more. At beginning of every row with double crochets replace first double crochet with 3 chain stitches. Finish row with 1 double crochet in 3rd or 2nd chain stitch from beginning of previous row (depending on whether previous round began with 3 or 2 chain stitches). On every row with single crochets replace first single crochet with 2 chain stitches. 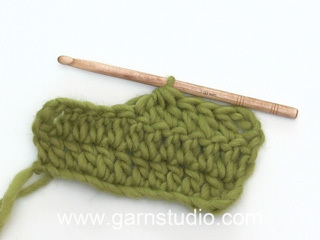 Finish row with 1 single crochet in 3rd or 2nd chain stitch from beginning of previous row. 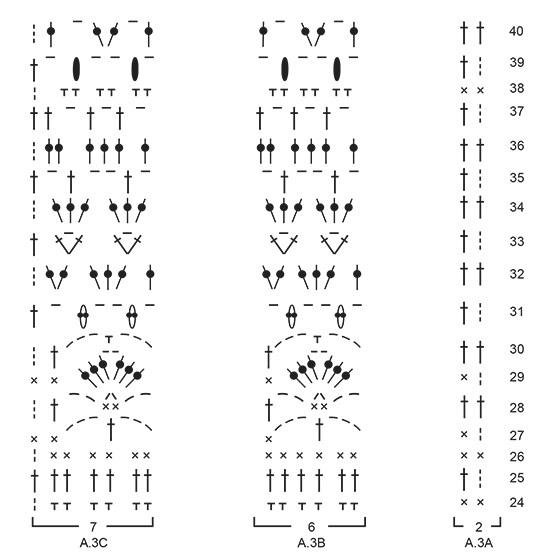 Stripes are explained below - rows are numbered in A.1, A.2 and A.3. To get a nice transition when switching color work last yarn over and pull through on last stitch before switching color with the new color, then continue with the new color. To avoid sewing many strands after color change work the first 2 double crochets/single crochets at beginning of every row with new color with double yarn (in the same color). This is done as follows: Make sure to leave a long yarn end (approx. 20-25 cm / 8"-9 3/4'') when switching color, work yarn end together with strand from ball. Then place yarn end along stitches from previous row and work around it so that the yarn end is hidden inside the stitches. In addition should the yarn end left at the end of row also be placed along the stitches when turning the piece to work around this yarn end as well. The way the strands are fastened without using a needle. Decrease 1 stitch in each side inside the 2 outermost stitches in each side. Decrease by skipping last stitch in each side before the 2 outermost stitches. 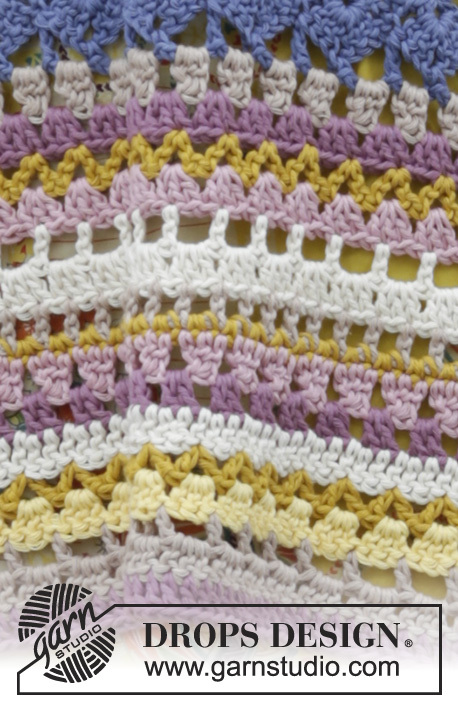 It is difficult to predict where the decrease is done in the pattern, the decreases are therefore not in any chart, but try to adjust to a row with double crochets/chain stitch (not large chain spaces). 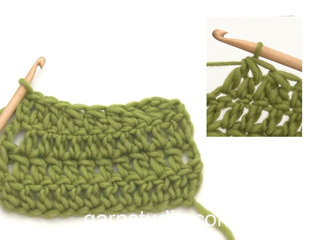 Increase 1 stitch by working 2 single crochets in 1 stitch. Work front and back piece back and forth in parts. First work right shoulder at the front with increase for neck, then work left shoulder at the front with increase for neck before pieces are put together then work back and forth until finished measurements. Work back piece the same way. Work sleeves back and forth, top down. 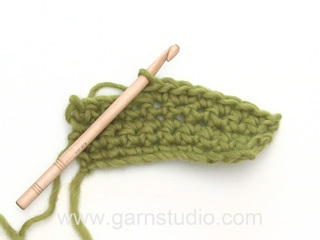 Read CROCHET INFO and COLOR CHANGE TIP! Work 36-36-36-44-44-44 chain stitches on hook SIZE 5.5 mm/US 9 with gray blue. Work first row as follows from wrong side: Work 1 double crochet in 4th chain stitch from hook, * skip 1 chain stitch, 1 double crochet in each of the next 3 chain stitches *, work from *-* the entire row = 26-26-26-32-32-32 double crochets on row. Then work STRIPES BODY - see explanation above, AT THE SAME TIME work pattern as explained below. Work first row as follows from right side (with gray blue): Work A.1A (= 2 stitches), work A.1B over the next 18-18-18-24-24-24 stitches (= 3-3-3-4-4-4 repetitions of 6 stitches) and finish with A.1C (= 6 stitches). Continue with stripes and pattern back and forth like this until A.1 has been worked. REMEMBER THE CROCHET GAUGE! Put piece aside and work left shoulder as explained below. Work 36-36-36-44-44-44 chain stitches on hook SIZE 5.5 mm/US 9 with gray blue. Work first row as follows from wrong side: Work 1 double crochet in 4th chain stitch from hook, * skip 1 chain stitch, 1 double crochet in each of the next 3 chain stitches *, work from *-* the entire row = 26-26-26-32-32-32 double crochets on row. Then work STRIPES BODY, AT THE SAME TIME work pattern as explained below. Work first row as follows from right side (with gray blue): Work A.1D (= 7 stitches), work A.1B over the next 12-12-12-18-18-18 stitches (= 2-2-2-3-3-3 repetitions of 6 stitches) and finish with A.1E (= 7 stitches). Continue with stripes and pattern back and forth like this until A.1 has been worked. At the end of last row work 13-19-25-19-25-31 somewhat loose chain stitches for neck. Now work parts together for front piece as explained below. Begin from right side with right shoulder front, continue over chain stitches for neck (work 1 double crochet in every chain stitch) and then work over stitches on left shoulder front as follows: Work A.2A (= 2 stitches), work A.2B over the next 60-66-72-78-84-90 stitches (= 10-11-12-13-14-15 repetitions of 6 stitches) and finish with A.2C (= 7 stitches). Continue with stripes and pattern back and forth like this. When A.2 has been worked 1 time vertically, work A.3 1 time vertically the same way. 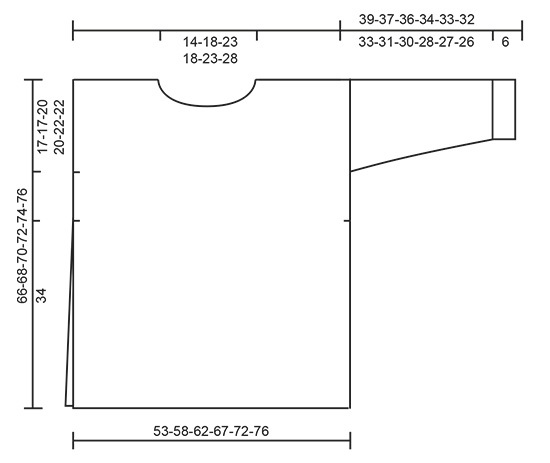 Then work A.2 again until 2 cm / 3/4'' remain before finished measurements as explained further down in pattern. AT THE SAME TIME when piece measures 17-17-20-20-22-22 cm/ 6 3/4"-6 3/4"-8"-8"-8 3/4"-8 3/4" from cast-on edge, insert 1 marker in each side to mark the armholes. Then work the 2 outermost stitches in each side with double yarn until finished measurements - read TIP FOR FASTENING STRANDS! Then work as explained below until piece measures approx. 64-66-68-70-72-74 cm / 25¼''-26''-26¾''-27½''-28 3/8''-29 1/8''. Switch to dark old pink and work 1 row with double crochets - NOTE: Choose a row with double crochets from one of the diagrams that fit where you are in repetitions to get 69-75-81-87-93-99 double crochets on row. Fasten off. Front piece measures approx. 66-68-70-72-74-76 cm / 26''-26¾''-27½''-28 3/8''-29 1/8''-30'' from shoulder and down. Work 36-36-36-44-44-44 chain stitches on hook SIZE 5.5 mm/US 9 with gray blue. Work first row as follows from wrong side: Work 1 double crochet in 4th chain stitch from hook, * skip 1 chain stitch, 1 double crochet in each of the next 3 chain stitches *, work from *-* the entire row = 26-26-26-32-32-32 double crochets on row. Put piece aside and work right shoulder back as explained below. Work 36-36-36-44-44-44 chain stitches on hook SIZE 5.5 mm/US 9 with gray blue. Work first row as follows from wrong side: Work 1 double crochet in 4th chain stitch from hook, * skip 1 chain stitch, 1 double crochet in each of the next 3 chain stitches *, work from *-* the entire row = 26-26-26-32-32-32 double crochets on row. At the end of this row work 17-23-29-23-29-35 somewhat loose chain stitches for neck. Now work parts together for back piece as explained below. Begin from right side with right shoulder back, continue over chain stitches for neck and then work over stitches on left shoulder back as follows: Work A.1A (= 2 stitches), work A.1B over the next 60-66-72-78-84-90 stitches (= 10-11-12-13-14-15 repetitions of 6 stitches) and finish with A.1E (= 7 stitches). Continue with stripes and pattern back and forth like this. When A.1 has been worked, work A.2 the same way. After A.2 work A.3 the same way until A.3 has been worked 1 time vertically. Then work A.2 again until 2 cm / 3/4'' remain before finished measurements - adjust according to front piece. AT THE SAME TIME when piece measures 17-17-20-20-22-22 cm/ 63 /4"-6 3/4"-8"-8"-8 3/4"-8 3/4" from cast-on edge, insert 1 marker in each side to mark the armholes. Then work the 2 outermost stitches in each side with double yarn until finished measurements as on front piece. Work until piece measures approx. 64-66-68-70-72-74 cm / 25¼''-26''-26¾''-27½''-28 3/8''-29 1/8'', adjust according to front piece. Switch to dark old pink and work 1 row with double crochets - NOTE: Choose a row from one of the diagrams that fit where you are in repetitions to get 69-75-81-87-93-99 double crochets on row. Fasten off. Back piece measures approx. 66-68-70-72-74-76 cm / 26''-26¾''-27½''-28 3/8''-29 1/8''-30'' from shoulder and down. Remember TIP FOR FASTENING STRANDS! Work 61-61-69-69-77-77 chain stitches on hook SIZE 5.5 mm/US 9 with light old pink. Work first row as follows from right side: Work 1 double crochet in 4th chain stitch from hook, work 1 double crochet in next chain stitch, * skip 1 chain stitch, work 1 double crochet in each of the next 3 chain stitches *, repeat from *-* the entire row = 45-45-51-51-57-57 double crochets on row. 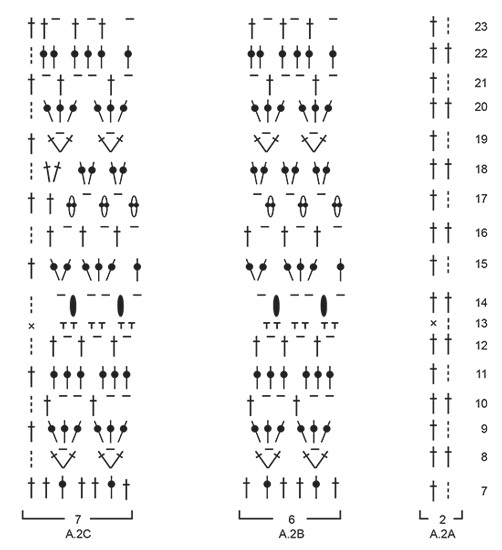 Next row is worked from the wrong side: 4 chain stiches (equals to 1 double crochet and 1 chain stitch), skip 2 double crochets, * 2 double crochets in the space before the next 3 double crochets, 1 chain stitch *, work from *-* until 3 double crochets remain on row, skip 2 double crochets and finish with 1 double crochet in last double crochet = 45-45-51-51-57-57 stitches on row. Then work STRIPES SLEEVE – see explanation above, AT THE SAME TIME continue pattern as on body, i.e. 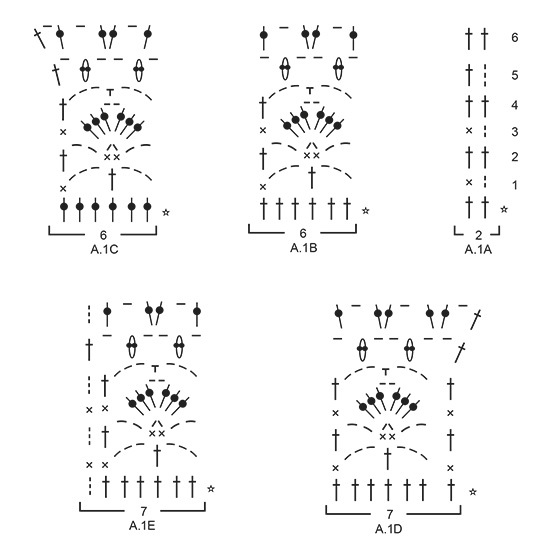 begin at beginning of A.2 (row 7) and work A.2. When A.2 has been worked, work the 2 first rows in A.3, then work A.2 to finished measurement (in most sizes the correct sleeve length will be finished before A.2 is done first time). AT THE SAME TIME when piece measures 2 cm / 3/4'', decrease 1 stitch in each side - read DECREASE TIP. Decrease like this approx. every 5-4½-3½-3-2½-2½ cm / 2"-1 3/4"-1 1/4"-1 1/8"-7/8"-7/8'' 7-7-9-9-10-10 times in total in each side = 31-31-33-33-37-37 stitches on row. When sleeve measures approx. 33-31-30-28-27-26 cm (shorter measurements in the larger sizes because of wider shoulders) work with gray blue from now on. 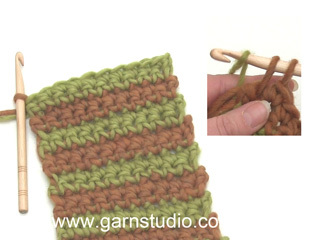 Work 1 row with single crochets from wrong side while increasing 2-2-6-6-8-8 stitches evenly - read INCREASE TIP = 33-33-39-39-45-45 single crochets. Work next row as follows from right side: A.1A (= 2 stitches), work A.1B over the next 24-24-30-30-36-36 stitches (= 4-4-5-5-6-6 repetitions of 6 stitches) and finish with A.1E (= 7 stitches). Continue pattern like this but finish after 3rd row in A.1. Fasten off. Sleeve measures approx. 39-37-36-34-33-32 cm / 15 1/4"-14½"-14 1/4"-13½"-13"-12½'' from top and down. Work the other sleeve the same way. Sew the shoulder seams with gray blue. Sew in sleeves between the markers on front and back piece. Sew underarm and side seams in one - begin at the bottom of sleeve and sew in edge stitch but finish seam when approx. 34 cm / 13½'' remain for vent in each side on front and back piece. Begin on shoulder and work first round as follows on hook SIZE 5.5 mm/US 9 with dark old pink: Work 1 single crochet in first stitch, * 3 chain stitches, 1 single crochet around next row/chain space *, work from *-* along the entire neck, finish with 3 chain stitches and 1 slip stitch in first single crochet at beginning of round. Work slip stitches until middle of first chain space, work 3 chain stitches, * 1 single crochet around next chain space, 2 chain stitches *, work from *-* the entire round, finish with 1 slip stitch in first chain stitch at beginning of round. Fasten off. Opis dla rękawów mówi, żeby zamknąć 1 oczko z każdej strony gdy długość robótki wynosi 2 cm. Czy te 2 cm mam liczyć od początku robótki, czy od rozpoczęcia wykonywania schematu A2? I kolejne pytanie - co to znaczy zamykać oczka w odległości 2 oczek od brzegu? Czy oznacza to, że na początku rzędu mam przerobić 2 oczka i potem zamknąć następne oczko, tzn, przerobić razem trzecie i czwarte, a na końcu rzędu przerobić razem dwa oczka przed ostatnimi dwoma oczkami? Witaj Małgosiu! Pierwsze pytanie - te 2 cm liczysz od początku (góry) rękawa. Drugie pytanie - na początku rzędu: przerabiasz normalnie 2 pierwsze oczka (1 oczko w każde oczko), omijasz następne oczko (trzecie oczko w poprzednim rzędzie) i wykonujesz 1 oczko w czwarte oczko (4 oczka przechodzą w 3 oczka). Na końcu rzędu, jak zostają 3 oczka do końca: omijasz 1 oczko i przerabiasz 2 ostatnie oczka. Miłej pracy! Mam pytanie odnośnie połączenia ramion tyłu swetra. Wykonałam wg opisu najpierw ramie lewe, potem ramię prawe, na końcu którego wykonałam 29 oczek łańcuszka (wg opisu oba ramiona strona lewa). Dalej opis mówi, żeby zacząć od prawego ramienia na prawej stronie robótki. Kiedy obracam robótkę (to prawe ramię) to na początku jest łańcuszek a po nim dalsza część prawego ramienia, więc jak mam połączyć go z lewym? Witaj Małgosiu! Zakończyłaś prawe i lewe ramię na prawej stronie robótki, teraz połącz łańcuszek prawego ramienia z lewym ramieniem za pomocą 1 oczka zamykającego. Teraz bierzesz nową nitkę i zaczynasz kolejny rząd ponownie na prawej stronie i przerabiasz zaczynając od prawego ramienia, dalej łańcuszek i lewe ramię następująco: schemat A.1A (= 2 oczka), A.1B ponad 60-66-72-78-84-90 następnymi oczkami (= 10-11-12-13-14-15 motywów po 6 oczek) i zakończyć przerabiając A.1E (= 7 oczek). Powodzenia! Ik haak maat S. Als ik de eerste toer waarbij schouder, lussen van de halen andere schouder met elkaar verbonden worden, kom ik uit op 9 herhalingen van 6 steken en eindigend op 7 steken. Moeten de losse voor de hals niet met 6 lossen vermeerderd worden? Als je beide schouders hebt gehaakt heb je 69 steken op de toer: 26 van de linker schouder, 26 van de rechter schouder en 13 van de lossenlus, plus daarnaast 4 meerderingen van de laatste toer in A.1c. Dit komt precies overeen met het aantal stokjes dat je moet haken zoals beschreven onder voorpand: A.2a: 2 steken, A.2b over de volgende 60 steken en de 7 steken van A.2c. Hvad er forskellen på at starte på vrang og ret siden i højre og venstre skulderstykke? Samt hvilken vej skal jeg læse diagrammerne? Kan i måske give en forklaring på hvordan jeg gør? Hoe maak je een stokje om losse? Dag Joerga, Normaal haak je een stokje in de steek of losse van de volgende toer, door onder a.h.w. de haaknaald in de steek te steken. Als je een stokje om de losse maakt, steek je de haaknaald helemaal onder de losse van de vorige toer, dus niet in de steek maar om de steek. I have started this pattern. I have worked the right and left shoulder fronts but do not understand how to start the front piece. Am I attaching the chains from the left shoulder to the right shoulder? Where are these "60 stitches coming from if I only chained 13? Thank you. Dear Sarah, chains from the left and right shoulders are "joined" when working 1st row on front piece over both shoulders: you work A.2A over the first 2 sts on right shoulder, then work A.2B over the next 60 sts (= the next sts on right shoulder + the 13 chain at the end of right shoulder + the 13 chains at the beg of left shoulder + the first sts on left shoulder) and finish with A.2C over the last 7 sts on left shoulder. Happy crocheting! Ik wil deze in 1 kleur haken, hoeveel garen heb ik dan nodig? Hallo Leonore, Deze vraag zal ik doorspelen aan designafdeling. Als je niet kunt wachten met beginnen: vaak kun je overgebleven garen terug brengen bij de winkel. (Vraag even binnen welke termijn) Als je dan het achterpand en een mouw haakt, kun je dit wegen en uitrekenen hoeveel je in totaal nodig hebt.